Fig. 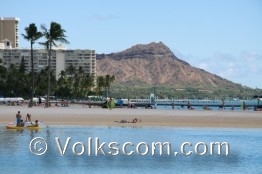 : The famous beaches in Waikiki Beach are located in front of the Diamond Head Crater. 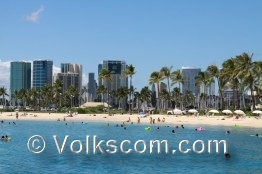 Beaches in Honolulu and Waikiki Beach. 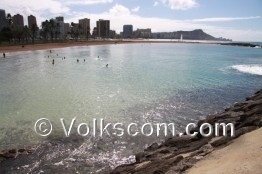 The Queen’s Surf Beach is located next to the Waikiki Natatorium War Memorial. Lifeguards are provided at this leveled white sandy beach. Restrooms are located at the side of the Waikiki Natatorium War Memorial. 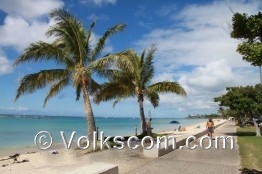 Parking space is available at the Kalakaua Avenue. 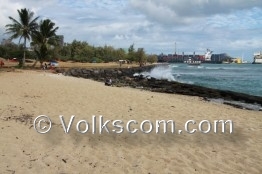 No entrance fee is charged at the Queen’s Surf Beach in Oahu (as at: September 2011). 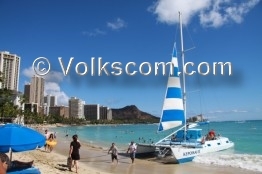 The Sans Souci Beach in Waikiki Beach is situated east of the Kuhio Beach. 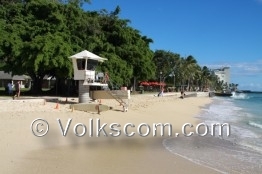 Lifeguards, restrooms and showers are provided at the Sans Souci Beach. Parking space is available at the Kalakaua Avenue. 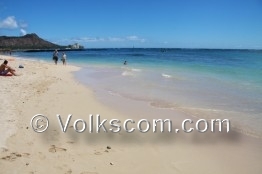 No entrance fee is charged at the Sans Souci Beach in Oahu (as at: September 2011). 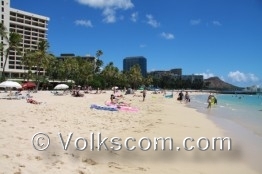 The Kuhio Beach Park is situated next to the Kalakaua Avenue. A lot of tourists are visiting this beach. Lifeguards, showers and restrooms are provided at the Kuhio Beach. No parking space is available at this beach. Parking space is only available at the side roads and at the hotels. A parking fee is charged. 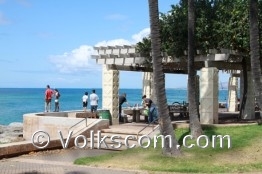 No entrance fee is charged at the Kuhio Beach in Oahu (as at: September 2011). 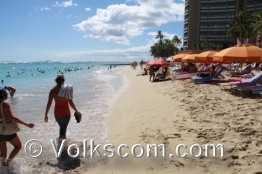 The Waikiki Beach is only a certain area of the sandy shoreline in Waikiki Beach. 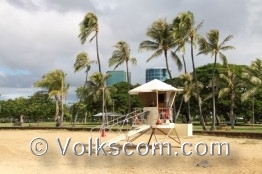 Lifeguards, restrooms and showers are provided at the Waikiki Beach. No parking space is available at this beach. Parking space is only available at the side roads and at the hotels. A parking fee is charged. 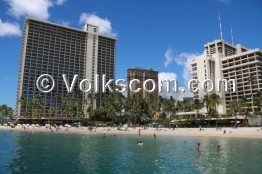 No entrance fee is charged at the Waikiki Beach in Oahu (as at: September 2011). 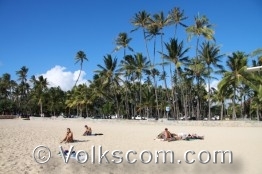 A white sandy beach is located at the Fort Derussy Beach Park in Waikiki Beach. Showers and restrooms are provided at this beach. No parking space is available at this beach. Parking space is only available at the side roads and at the hotels. A parking fee is charged. 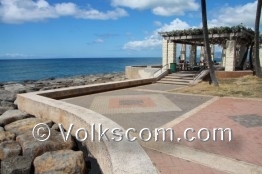 No entrance fee is charged at the Fort Derussy Beach Park in Oahu (as at: September 2011). 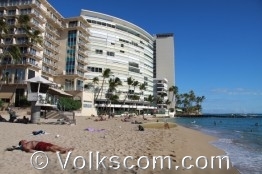 The Duke Kahanamoku Beach is located next to the Hilton Hawaiian Village hotel. 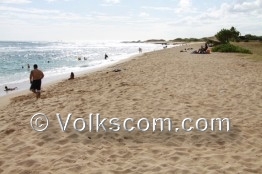 The beach at the Duke Kahanamoku Beach is a withe sandy beach. Restrooms and showers are provided at this beach. 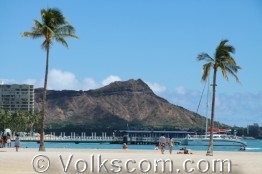 Parking space is available at the Ala Wai Yacht Harbor, at the Hotels and at the sideroads. A parking fee is charged. 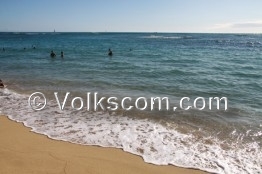 No entrance fee is charged at the Duke Kahanamoku Beach in Oahu (as at: September 2011). 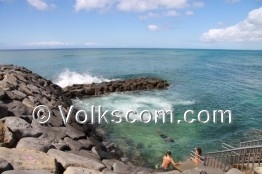 The Duke Kahanamoku Lagoon resp. 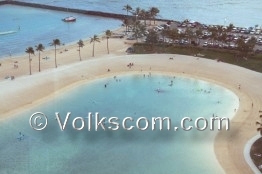 the Hilton Lagoon is a small lake, located next to the Hilton Hawaiian Village hotel and the Ala Wai Yacht Harbor. 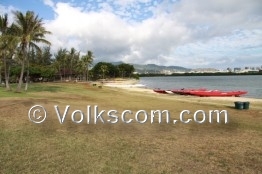 Parking space is available at the Ala Wai Yacht Harbor, at the Hotels and at the sideroads. A parking fee is charged. 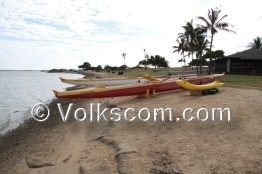 No entrance fee is charged at the Duke Kahanamoku Lagoon resp. 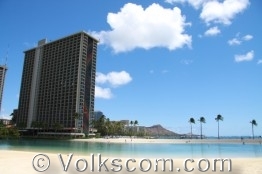 the Hilton Lagoon in Oahu (as at: September 2011). 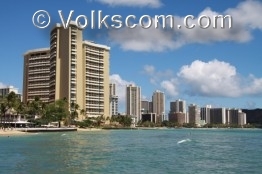 The Ala Moana State Recreational Area is situated next to the Ala Moana Center shopping mall. 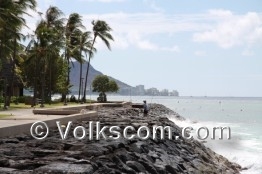 Two beaches are situated at the Ala Moana State Recreational Area. 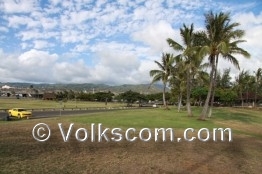 No parking fee and no entrance fee is charged at the Ala Moana State Recreational Area in Oahu (as at: September 2011). 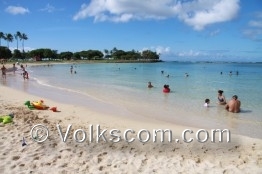 This beach in the Ala Moana State Recreational Area is located at the Magic Island. Lifegeguards, showers and restrooms are provided at this beach. Small stones are lying in the sand. 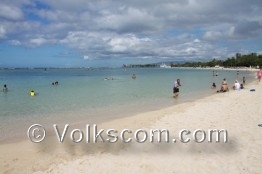 A long white sandy beach is situated at the Ala Moana Beach. 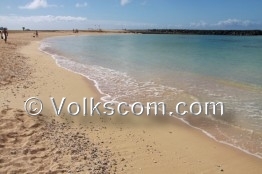 Lifegeguards, showers and restrooms are provided at this beach. Small stones are lying in the sand. No sandy beach exists at the Point Panic Beach. 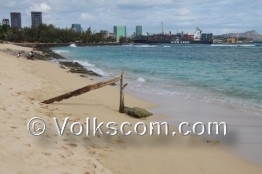 Only a small ocean access for surfers is available at this beach. Restrooms are provided at this beach. 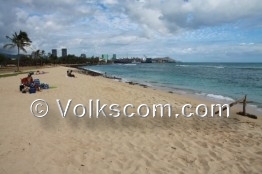 No parking fee and no entrance fee is charged at the Point Panic Beach Park in Oahu (as at: September 2011). 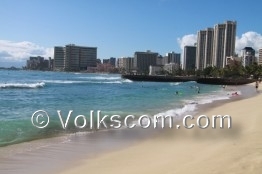 The Sand Island State Recreational Area is located at the opposite waterside of the Aloha Tower in Honolulu. A campground, restrooms and showers are provided at the Sand Island Recreational Area. Stones are located in the sand and rocks under the waters surface. A large parking lot is located in the Sand Island Recreational Area. No parking fee and no entrance fee is charged at the Sand Island State Recreational Area in Oahu (as at: September 2011). 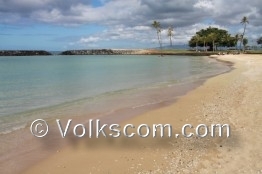 A narrow beach is located at the Keehi Lagoon Beach Park / Kaka’ako Waterfront Park. Lot’s of small stones and some canoes are lying at this beach. Showers and restrooms are provided at this beach. 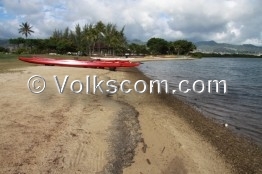 No parking fee and no entrance fee is charged at the Keehi Lagoon Beach Park in Oahu (as at: September 2011).